The Israelites had a habit of forgetting about God and his faithfulness and needed reminders...not unlike me. How often do I complain about the way life is and sigh dreaming about how I want life to be? I often forget all of the blessings God has given me, all of the things he has brought me through, and how he has grown me. So I decided to make my own Ebenezer. 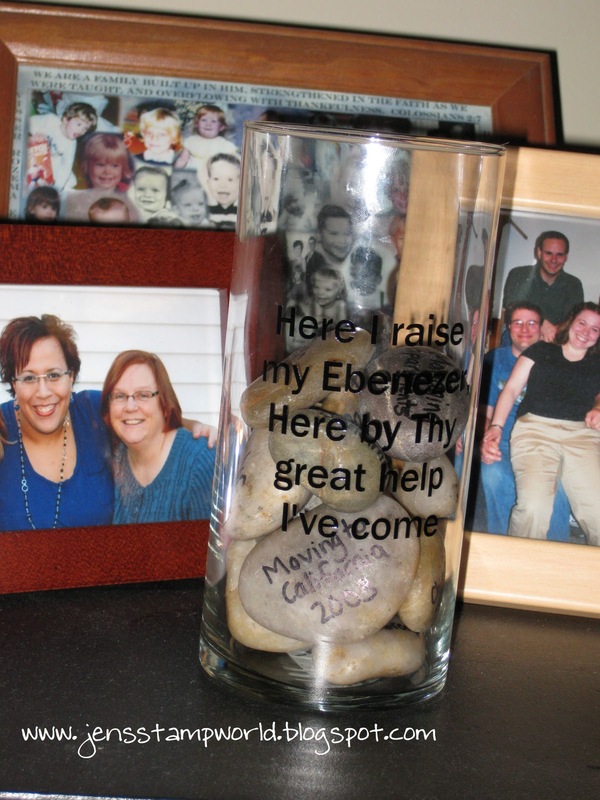 I started with river rocks that I purchased at Michaels (with a coupon of course) and used a permanent marker to write down blessings, hard times God has brought me through, people God has placed in my life, opportunities He has given me, etc. 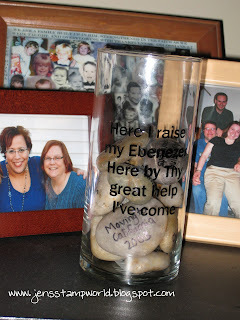 When I finished I just placed them carefully in the vase. I used my Silhouette SD to cut black vinyl to put on the vase. 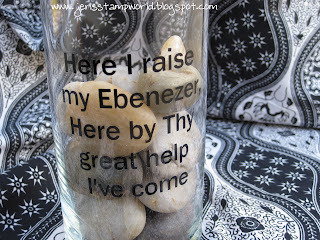 It says, "Here I raise my Ebenezer, Here by Thy great help I've come"
This Ebenezer is mostly a reminder for me, but if people ask me, "What do these stones mean?" I will be able to tell them about God's faithfulness in my life. Awesome! What a beautiful piece, a great reminder of His blessings, and a means to share your testimony. I also love Come Thou Fount. That's so cool Jen. I love it! That's a great idea, Jen! I love it! That's beautiful! Maybe I'll do one so everyone in my family can contribute. What a wonderful idea! 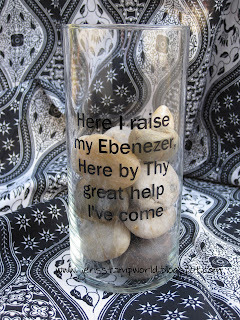 Come Thou Fount is one of my favorite hymns--because I LOVE "Here I raise my Ebenezer"!! I have some river rocks my kids collected and today I was wondering what to do with them. thank you for this blessing! Three Favorite Thursday--I got pinned! Winner, Winner Book--What Is He Thinking? ?